Mid-twentieth-century capitalism has turned into global capitalism, and global capitalism¡ªturbocharged, Web-based, and able to find and make almost anything just about anywhere¡ªhas turned into supercapitalism. 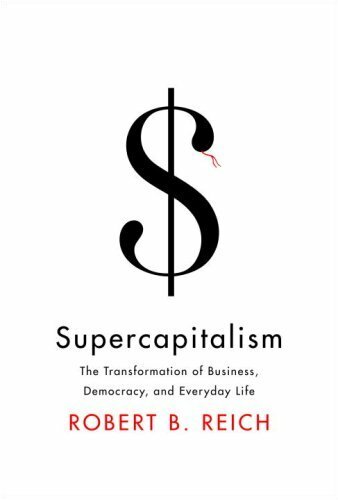 But as Robert B. Reich makes clear in this eye-opening book, while supercapitalism is working wonderfully well to enlarge the economic pie, democracy¡ªcharged with caring for all citizens¡ªis becoming less and less effective under its influence. Reich explains how widening inequalities of income and wealth, heightened job insecurity, and the spreading effects of global warming are the logical outcomes of supercapitalism. He shows us why companies, fighting harder than ever to maintain their competitive positions, have become even more deeply involved in politics; and how average citizens, seeking great deals and invested in the stock market to an unprecedented degree, are increasingly loath to stand by their values if it means biting the hands that feed them. He makes clear how the tools traditionally used to temper America's societal problems¡ªfair taxation, well-funded public education, trade unions¡ªhave withered as supercapitalism has burgeoned. Reich sets out a clear course to a vibrant capitalism and a concurrent, equally vibrant democracy. He argues forcefully that the spheres of business and politics must be kept distinct. He calls for an end to the legal fiction that corporations are citizens, as well as the illusion that corporations can be "socially responsible" until laws define social needs. Reich explains why we must stop treating companies as if they were people¡ªand must therefore abolish the corporate income tax and levy it on shareholders instead, hold individuals rather than corporations guilty of criminal conduct, and not expect companies to be "patriotic." For, as Reich says, only people can be citizens, and only citizens should be allowed to participate in democratic decision making. Robert Reich has taken a very complicated situation and has broken it down into manageable parts. By so doing, he has made it all much easier to understand. He points out that it is not useful to demonstrate and boycott companies to try to make them "better corporate citizens." A Corporation is not a person. It is a series of contracts making an entity designed to make money for the shareholders. If we want a company to open itself to unionization, for instance, we should make laws to that effect so that all companies would have the same rules. If we don't want pollution, make a law against it. We are wasting our time to demonstrate against a corporation. Work instead to make laws eliminating corporate money from politics and lobbyists. If we got together to do these things instead of scattering our efforts against individual corporations, we might have an effect. I have always enjoyed reading books by Robert Reich because his writing is simple and straightforward. You don't have to be an economics guru to understand what he's talking about. He uses facts, statistics, and real life examples to back his argument. This book does a wonderful job in discussing the clash between capitalism and democracy. He talks about how powerful corporations have truly become both financially and especially politically. Consumers also don't have as much of a say in politics today as they did a decade ago because today, companies battle for laws and regulations that favor them and disadvantage others, e.g. - opposition to more economically friendly vehicles (increasing gas mileage). Politicans will naturally listen to the one who is able to contribute the most, and its not easy to compete with the many lobbyists hired by the large corporations, and the millions that are kicked into polotical campagins. Reich does not directly accuse anyone in his book, but instead shows both sides of the argument and allows the reader to make up his/her own mind, he writes "Condemning Wal-Mart for not giving its employees better pay and health benefits," Reich writes, "may be emotionally gratifying but has little to do with the forces that have impelled Wal-Mart to keep wages and benefits low and bestow good deals on Wal-Mart's customers and investors. Wal-Mart, like every other capitalist player, is, as I have emphasized, following the current rules of the game." Wal-Mart is not breaking the law; its just following that laws and regulations corpoartions have helped pass. I also understand that a corporation exists to look out for their shareholders and not the public. The shareholders have taken the risk to invest, and i agree that they should be rewarded but at what cost? The book also appears to hint that democracy and morality are slowly starting to take a back seat; Americans have invested billions in corporations and are much more unlikely to speak out against them even if the corporation is doing something wrong be it politically, socially or even environmentally. A wonderful line in the book is "as citizens, we have ideals, but as consumers, we have needs. We abhor child labor, for instance, but we want a cheap pair of jeans. And we might be dismayed over Main Street's demise, but we still look for bargains at Wal-Mart." This shows the hypocrisy of the individual while also showing the natural instincts of a consumer. There are several valuable aspects from this book which renders a 5 star rating. First, it gives an excellent historical perspective of capitalism in the United States focusing particularly on the period leading up the mid-'70's, and our current version of capitalism. The transition between the two periods, exemplified by the shifts in the manufacturing and the financial sectors, underscored the trend for more deregulation and increased competition. The forces behind these changes, in particular the emergence of technology, bring a new economic scheme to American capitalism. But then, he discusses the forces in play with our current model, Supercapitalism, and it is here where he develops his vision of viewing this model from the different roles that each of us play, ie, earner, investor, consumer, and citizen. I found this means of describing Supercapitalism most helpful, easy to understand, and intriguing. None of us are innocent; we all play some part of encouraging Supercapitalism. But, too, as our current situation shows, we, as citizens, are being gobbled up by our own market system. Lucid and compelling arguments are made. However, I would argue with the assumptions that anchor the arguments for Corporations. Corporations are supposedly only contracts, not real people. But if you take away the people, there is no corporation, because there is no agent who operates the said corporation within the real world with real actions. OK, first argument negated. He wants me to believe his thesis that Corporations have no moral duties or social responsibility. But if real people are carrying out the real actions in the name of a Corporation, then real people are dispensing with actions that are either moral or immoral behavior. Look, if the Nazi Party was only a corporate political organization that has no moral or social responsibility, then the individuals inside that organization, who gassed 6 million people, are not responsible for their actions. Right? The following 4 thoughts were my primary take-aways from this book. Dr. Reich is both an excellent writer/speaker and an individual I highly respect. While you may not agree with everything he says in this book, his arguments are one of a pragmatist, a rare breed in political circles. 1. Corporations are entities whose sole objective is to provide/generate goods/services desired by consumers while delivering profits to investors. Socially responsible behavior, while good for PR, is often only undertaken when it is either 1) economically profitable, or 2) economically neutral. 2. Governments should be representative agencies whose primary mission is to protect and serve the will of the people; corporations are NOT people. The money infused into government by corporations has effectively drowned out the issues of the citizenry, effectively undermining their ability to properly regulate issues that impact both groups. 3. The advent of Supercapitalism as defined by Reich is the result of a juxtaposition of the Western consumer. On one hand we are investors & consumers and on the other we are citizens. As consumers we demand the cheapest goods and the highest quality; As investors we demand steady returns on our money. But as citizens we demand fair pay, proper health care, and a secure future. Our demands as consumer/investors have worked in many cases to undermine our desires as citizens. 4. Decoupling health care from employment is both logical and prudent. Reich suggests that economic history after 1945 can be divided in two phases: the "almost Golden Age" and the ensuing phase of "super capitalism'. They roughly correspond with the age of mass-production/culture and the following period of diversification, long tail, etc. He provides an excellent description of the entanglement of commerce and American politics in both phases. His central thesis is that the current 'super capitalism' phase is marked by an substantial increase of the influence of companies on American politics. As consumers and investors Americans profited, but as citizens Americans lost influence. I beg to differ. It assumes that in the earlier phase citizens were more influential. There was indeed more regulation in those days, which suggests that politicians had more leverage. But were these regulations the reflection of the power of the people? Or were they the outcome of a system, sometimes referred to as the industrial-military complex, where things simply played out differently. Reich himself relates that during the "almost Golden Age" the CIA appeared to `discover' situations that required American military intervention whenever American business interest were at stake. I suggest that, using his own arguments and examples, a case could be made that commercial interests in that earlier phase had a far more direct and influential effect on American policies than in the phase of `super capitalism'. Robert Reich provides little new information in this superficial look at how global competition emerged in the last 60 years and makes questionable recommendations for how to improve matters. Unless you feel compelled to read every book that Professor Reich writes, you can skip this one. Unlike many commentators who praise or criticize business while ignoring society, Professor Reich attempts to reconcile the two. He is tougher on consumers than on business: Business is supposed to focus on making profits, and consumers who complain about business should realize that serving more interests could raise prices and cut customer benefits. Where Professor Reich gets worried is when competition for government favor becomes part of beating your business rival, when success in business causes a widening of income and net worth within the society, and citizen's interests are ignored by the political process. He feels that all of those factors are a problem now and are likely to get worse in the future. Professor Reich proposes very few solutions . . . and ones that aren't likely to be implemented. For income distribution, he wants to make the top rates in income higher (like in the 1950s), directly tax corporate shareholders on their share of corporate profits (to further boost the bite on the rich), and provide more of a social safety net for those who lose their jobs or have temporary problems. The political likelihood of those things happening is certainly quite low. In the field of corporate governance, he wants corporations to lose the right to sue and lobby government. Instead of suing companies, you'll sue individuals . . . something he feels would improve behavior quite a lot. Now, can you imagine business wanting to do those things? Wealth creation has probably never been more democratic in the United States. By studying the Forbes 400, we see that the great wealth is mostly new wealth, generated by entrepreneurs who mostly played by the rules. Education and access to capital to start up one's own business have never been more available. It's inevitable that income and wealth distribution will widen in a global economy. Why? The best will get paid on a global rather than a national scale while the least effective will have to compete with more people who are already paid a lot less. When the Berlin Wall fell, this effect was inevitable. I believe that having a non-responsive federal government is a problem, but that problem will probably have to be solved by the creation of a new political party (or conversion of an existing one) with a focus on representing the broad interests of citizens that corporations don't care about. I also think Professor Reich doesn't appreciate the extent to which the federal government's power will continue to wane versus the power of the largest and most effective companies. Government is going the way of agriculture in terms of becoming less important, except where corruption makes it hard to do business. Supercapitalism starts with an insightful summary of post-war economic history in the United States, from relatively egalitarian days of the "Not Quite Golden Age" to the more recent hypercompetitive era of Supercapitalism. Unfortunately, Professor Reich's analysis of the causes of the transition to Supercapitalism are unconvincing and his prescriptions for future reforms fall short. Reich argues that technological advancements, such as telecommunications and container shipping, created Supercapitalism. While technology undoubtedly played a role, its influence is gradual does not explain the sudden change of economic direction that occurred in the late 1970s. Reich greatly plays down the role of policy in creating Supercapitalism. He implicitly assumes that Supercapitalism is something that suddenly just happened because of technology, rather than being a conscious choice. But the 1970s were a decade of economic distress that led to a change in economic thinking, beginning with the deregulations of the Carter administration and accelerating in the Reagan era. The U.S. economy has boomed since those days and rarely looked back. Yes, income inequality has worsened, and there are other problems. But despite all its warts, we stick Supercapitalism because it delivers the economic goods. Robert Reich (RR) has an interesting take on the development of capitalism in the last 40 years, and one that might confound the expectations of critics who think of him one-dimensionally as a liberal Democrat/Clintonite. Some passages of the book might warm Milton Friedman's heart, were it now warmable. But the book is very weak on proposed solutions. @@ We are caught in a paradox today of doing very well as consumers and investors, while feeling increasingly powerless as citizens. "As consumers and investors we want the great deals" that the current form of capitalism brings, while "[a]s citizens we don't like many of the social consequences that flow from them," @ 89. Moreover, we don't know how to act effectively on our feelings as citizens - and we often direct our frustration at the wrong targets (such as at individual companies). @@ The situation was quite different prior to, roughly, the 1970s (Chapter 1). American industry was dominated by oligopolies, consumers had less choice, the Dow was a fraction of what it is now. Government intervened to control wages and prices, which made established players in industry more secure. (RR points out that as recently as 1994, over half of the Fortune 500 had been founded before 1930, @19.). Citizens belonged to a wider variety of local, regional and national unions and voluntary groups that were "countervailing forces" (in JK Galbraith's phrase) to industry. Government spent more of its time mediating between these countervailing interests. Up to this point, I felt that RR had a provocative thesis, albeit that many of its parts had been put forward by others previously. (E.g., as to CSR, David Vogel's excellent "The Market for Virtue" (2006), which RR mentions often.) Some may argue about historical points, such as whether regulation in the past 30 years has diminished (RR) or exploded (see other reviews on this page). However, even academic research showing a growing number of pages in the Code of Federal Regulations (e.g., Dawson, KYKLOS 2007 Feb. @15-36) isn't sufficient to negative RR's point about the shift in *who* is battling over what's printed on those pages today, compared to who did so during most of the 20th Century. RR also has some interesting observations on how antitrust laws are no longer discussed in the context of protecting small competitors, but rather of protecting consumer choice and investor return(e.g., @55n and 163.) Certainly the citizen side of me could identify with the feelings and trends RR describes. But the last chapter, "A Citizen's Guide to Supercapitalism," was a let-down. Much of it is a list of reasons not to trust politicians or executives who make certain types of claims. E.g., instead of believing executives who say their companies are doing something to advance the "public good," we should remember that "Companies are not interested in the common good. It is not their responsibility to be good," @ 214. Fine, but this is a missed opportunity for some constructive action. Surely there's some benefit if activists and others help or encourage companies to find good stuff to do that also happens to be profitable - this is like low-hanging fruit. RR never makes such a suggestion. The last section of the chapter is a surprising rant about corporate personhood. RR blasts the "legal fiction," as lawyers call it, that companies are persons. Instead, he claims they are aggregations of contracts between and among individuals. This theory isn't original, having been described by, among others, Jensen & Mechling in the 1970s, though RR doesn't cite any predecessors. Nor does he mention any of the less plausible idealizations implicit in this model, e.g. about rationality, utility maximization etc. RR draws many conclusions from the non-personhood of corporations, such as they shouldn't have to pay tax (which is shareholder money anyway) (@216ff) and should not have standing to sue (@222). This last notion seemed particularly half-baked. RR doesn't say that only individuals should be subject of regulation. So if corporations are regulated, why shouldn't they have standing to sue about those regulations at least? (Moreover, RR's literal assertion, "Noncitizens should have no right to [seek to overturn American laws and regulations] unless the law or regulations breach some international treaty," (id.) seems to imply that individual non-citizens also should not have standing to sue, e.g., to contest the Constitutionality of any law or regulation affecting their freedom or human rights.) It also seems rather quixotic to think that so many jurisdictions might purge this legal fiction from their laws and jurisprudence in one swoop (and BTW the personhood notion is even stronger in Europe than in the US). The more important issue, it seems to me, is not about personhood, but about balancing the rights of the entity (or of its aggregate of contracting shareholders, if we take RR's view) against the rights of individuals in other roles (as community, consumers, workers, etc.). Robert Reich's Supercapitalism is the best big-picture book I've read in years. Dispassionately, it cuts through partisan noise and pinpoints the competitive pressures that have driven global business to serve us all supremely well in our capacities as consumers and investors -- while simultaneously eroding democracy and community. Reich locates a technological tipping point in the mid-to-late 70s that destroyed big businesses' insulation from global competition and made managers answerable to institutional investors ever-ready to move capital to any competitor who maximizes profitability. These pressures produce great products, low prices, and high-return investment vehicles in which the majority of Americans have some share. The same forces also produce constant downsizing and outsourcing, relentless downward pressure on wages, culturally corrosive media and entertainment, and denuded downtowns. Even more dangerously, supercapitalism drives a lobbying arms race, in which each company and industry strives for competitive advantage on the legislative front (as in every other arena). Companies lobby not because they're conspiring to squeeze out the public interest, but to fend off rivals' attempts to gain advantageous legislation. The result is near-complete corruption of the legislative process as companies compete to buy legislation. Reich's argument is compelling in large part because he convincingly debunks the vilification of individual actors -- Wal-Mart, lobbying corporations, corrupt politicians, right wing ideologues. The fault, such as it is, lies with all of us. Insofar as we seek the highest quality goods at the cheapest price and highest possible returns on our investment, we are all cracking the whip that keeps wages low, insecurity high, compensation for those who deliver the goods astronomical, and money flooding our political system. Reich's account of a 'supercapitalism' that is eroding democracy constitutes a compelling challenge to the neo-Hegelian thesis of Francis Fukuyama's The End of History and the Last Man, which suggests that after the collapse of communism, human society worldwide has nowhere to go (or grow) but into democratic capitalism. These days, as we obsess with the Islamic backlash against globalism, it's fashionable to laugh at what's perceived as Fukuyama's triumphalism in that 1992 look forward. But Fukuyama's detractors are laughing at a caricature of his work. Fukuyama never suggested that the path to worldwide democracy would be smooth or swift or that it could not be derailed by irrational forces. Like Reich's, Fukuyama's argument is essentially Darwinian: he sees sheer competitive pressure driving underdeveloped societies, first toward capitalism, and then, as economic growth creates a middle class, toward democracy As wealth accumulates in an authoritarian free market country, Fukuyama suggests, a critical mass of people acquire both the means and the motivation to ensure that they can't be robbed or stymied by an unaccountable government. Fukuyama is one of a long line of thinkers who sees democracy as an outgrowth of free markets and wealth accumulation. What's troubling -- and truly new -- about Reich's thesis is that it may be the first clear look at the next phase -- when hypercompetition, i.e. supercapitalism, begins in turn to erode the democracy already achieved. Reich is at pains to demonstrate that ills appearing first in the U.S. -- widening income inequality, Walmartization of commerce, political sclerosis induced by massive lobbying, uncontrollably obscene and mindless mass culture and entertainment -- are also at work in Europe and Japan. Reich is much better at diagnosing the problem than at proposing solutions. Indeed, the cumulative impression is that supercapitalism is a juggernaut that overwhelms everything in its path. Reich's proposed solutions boil down to two: genuine lobbying and campaign finance reform, and a new regulatory regime that reins in supercapitalism's steroidal competitive excesses. But which of us will bell the cat? It's a chicken-and-egg question that Reich does not really address: how can a corrupted political process regain the autonomy and authority to rewrite the rules of the game? The implied answer, I think, is the exhaustion of the parties themselves. Businesses are not reveling in their lobbying prowess -- in fact, they are sick of legislative death matches and of being shaken down by politicians. The recent stirrings of large industry groups calling for serious dialog about health care reform may be a bellwether. Perhaps there will be a twenty-first century magna carta, in which the lords of industry hammer out a truce (or long series of truces) with legislators and agree to a kind of lobbying arms control. So-so, but you're better off with the NeoMarxists if you want to learn about this topic. Supercapitalism, written by Robert Reich, is an amazing book and should be read by every single American citizen. The book is a historical look at American Capitalism and Democracy and how they've been intertwined and even how they've diverged in recent years. This divergence, Reich argues, is due to Supercapitalism. What does this mean? It means that this country has moved past a mixture of democracy and capitalism into a new era of greed. Consumers love the cheap prices we find online and in discount stores but we get angry when jobs are sent overseas. Investors love the high returns that stocks have provided to us but we get upset when the companies we invest in cut costs be laying off there staff. Has anyone stopped to realize that the reason these jobs are going overseas is because we (as consumers) demand cheaper prices and we (as investors) are demanding higher returns? There is a lot of information in this book and much of it has opened my eyes to what Capitalism and Democracy in America used to mean....and what it means today. Robert Reich blends the ideas that not only are companies but also citizens of America are to blame for the current economic crisis. He details the rise and ultimate fall of deregulation, the increased availability of resources and the somewhat new idea of fierce competition between deeply rooted and fledgling companies. Mr. Reich shows that corporations looking to increase their stock prices are hurting the economy by the ways they go about doing so. But the most telling aspect of the story is how we, as citizens of America, are allowing these corporations to continue their greedy ways and how we are almost of the same mindset.